This startup iOS app was taken over and developed to an acceptable release state by Kurt Jensen. Feature improvements/bug fixes spanned iOS and custom nodeJS server/api. Swift 3, nodeJS Express, mongoDB. Spinfire is a revolutionary Digital Club Marketing Platform where a music artist of any genre can get their single played in any club On Demand!! Through Spinfire, artists gain access to club DJs, local and nationwide, to promote their music and get exposure in the hottest club venues that they choose! 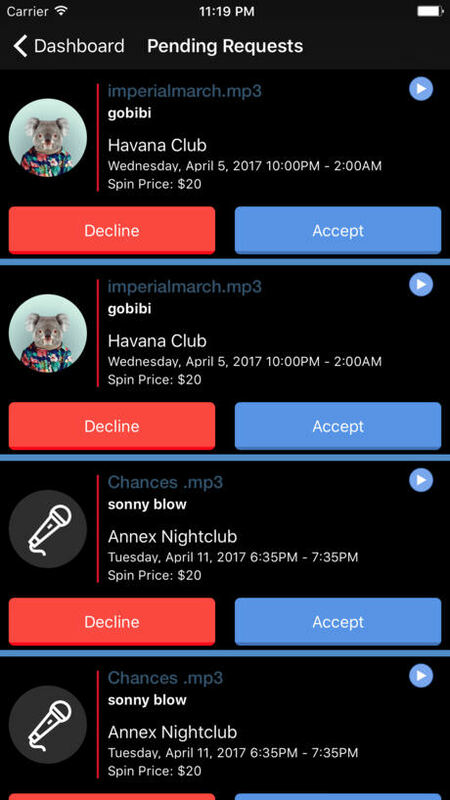 Artists can search for DJs by name, city or club, make an in app purchase and submit "Spin Requests" to that Club DJ. Once the artist's hot single is played, the DJ will deliver "Proof of Play", which is an in-app video of the artist's song being played in that venue to a live crowd. Its that simple!! Access the hottest DJs everywhere • Spinfire gives artists access to DJs who spin all genres of music around the globe and who are waiting to break your new music. Get your club single played On Demand • Control your marketing. Get your music exposed to nationwide audiences • Get as much repetition as you need to get your single hot everywhere. Get Instant Feedback To Your Music • Take your hit single straight from the recording booth into the club. • The wait game is over and the playing field just got leveled.